The University has honoured Emeritus Professor Tony Redmond, a world-leading specialist in emergency medicine, with its highest Medal, the Medal of Honour. Tony was born in Manchester and qualified in Medicine from this University. He subsequently trained in Accident and Emergency medicine and was appointed Lecturer here in Accident and Emergency Medicine in 1979. He is now Emeritus Professor of International Emergency Medicine at the Humanitarian and Conflict Response Institute (HCRI) at The University of Manchester, which he co-founded in 2008. HCRI is a World Health Organisation (WHO) Collaborating Centre for Emergency Medical Teams and Emergency Capacity Building. In 1994 he established and is now Chair of UK-Med, an NGO that provides international emergency humanitarian medical assistance to countries affected by conflict and sudden onset disasters. UK-Med is housed within HCRI and the two work closely together. He is Honorary Colonel to 207 The Manchester Field Hospital and Immediate Past President of the Manchester Medical Society. He is the current President of the World Association for Disaster and Emergency Medicine and Visiting Professor of Disaster Medicine at the University of Sichuan, China. He was awarded the Soviet Order for Personal Courage for work in the aftermath of the earthquake in Armenia and an OBE for humanitarian assistance to Sarajevo. Tony is married to Caroline, who was a fellow student at The University of Manchester. They have three children, Katy, Sarah and Helen, and three grandchildren, Thea, Oliver and Rosa. 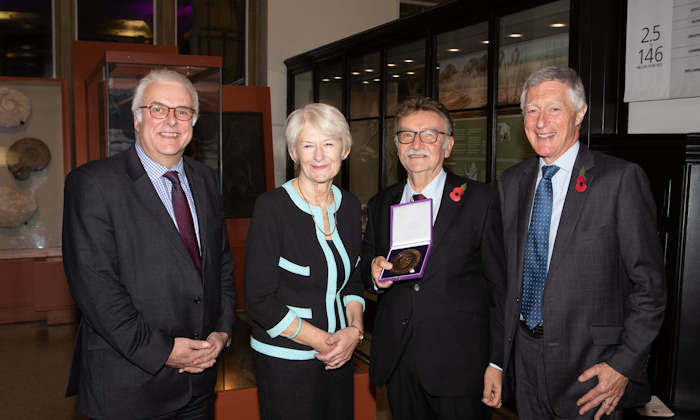 The photo shows Interim Vice-President and Dean of the Faculty of Biology, Medicine and Health, Professor Peter Clayton, the President and Vice-Chancellor, Professor Dame Nancy Rothwell, Medal of Honour recipient Emeritus Professor Tony Redmond and the Deputy Chair of the Board of Governors, Dr John Stageman.